The Garden of Proserpine is taken from A.C. Swinburne’s collection Poems and Ballads (1866), works notorious for their eroticism, republicanism and antitheism. For Vaughan Williams’ generation the book remained a watchword for modernity and rebellious free-thinking. The Garden of Proserpine (completed in 1899), is considered to be the composer’s first attempt at a large-scale work. … The distinctive tone that we are used to hearing in Vaughan Williams’ later works is present even here and comparisons can be drawn with the Sea Symphony (amongst others). In the Fen Country is given a sensitive performance by the Bournemouth Symphony Orchestra. 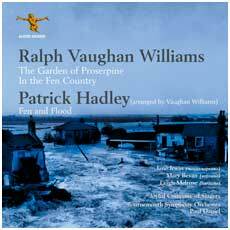 The other premiere is Patrick Hadley’s two-part cantata Fen and Flood. Vaughan Williams persuaded Hadley to let him arrange the work for SATB and orchestra. The effect is devastating; feelings of despair and panic come across with great clarity.